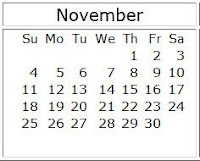 November brings colder weather, and the start of the long holiday season. Late Fall and Winter seasonal beers and indoor events are now the norm. There are always plenty of drink and food events going on at most Colorado breweries and entertainment venues as well. This page will be updated often as news of upcoming events are announced. Here is a list of the upcoming Colorado beer fests, beer dinners, tapping parties, seminars and related events for November 2012. These listings are updated every week, so stop back often to see the latest happenings with beer in Colorado. Dates and events are subject to change at any time so please check with the event web site before attending. If you know about another event not listed here please add a comment below. Time: Fri. 6-9pm, Sat. 1-4pm & 5-8pm, Sun. 2-5pm. Cost: $12 advance, $15 at the gate plus Expo ticket. Colorado skiers and riders are passionate about their powder, their resorts and their favorite trails. Many of them are equally passionate about their favorite beers, brews and ales that they enjoy apres ski. So, at this year’s 21st Annual Colorado Ski & Snowboard Expo, the second annual, Rocky Mountain Brew Fest returns. For an additional $12 ($15 at the door) and with an expo ticket, Expo visitors can sample dozens of handcrafted beers and ales during one of four 3-hour tasting sessions throughout the weekend. Admission includes three beer samples, plus one full beer. The brew with the most full beers poured will be declared the People's Choice Winner for this year's Brew Fest. Additional sampling tickets will also be available for purchase. Freedom Financial Expo Center - 3650 N. Nevada Ave.
Time: 2 sessions - 1:00pm-4:30pm and 6:30pm-10:00pm. VIP get in 1 hour early. Cost: $40 VIP, $30 regular, $25 military, $10 designated driver. One of the biggest brew fests in Colorado Springs now in its 6th year. Live music and all you can sample brews from some of the best Colorado-only brewers. Food, brewer merchandise, entertainment, and a designated driver program. 21 and over only event. Cost: $20 for crockpot contestants, or $30 regular attendees. A crockpot cook-off benefiting Boulder Mountainbike Alliance (BMA) and featuring Twisted Pine hand-crafted beer. Sign-up to bring your crockpots. Bring in your pot roasts, your soups, your curries, your puddings, your stews. Make it a team efforts. Support BMA. Your entry fee includes 3 pints of Twisted Pine brew, all the crockpot delicacies you care to eat, and an entry into a drawing for prizes. More details at: sportsgarage.net/crocktoberfest. Gather your friends and introduce them to one of the greatest hobbies around. Learn to Homebrew Day was established by the American Homebrewers Association (AHA) in 1999. Brewing sites are held all around the world so people can learn how to brew or teach others how to brew. Cost: $25 advance, or $32 at the door. They're tapping a reserved keg of every Wynkoop beer made in 2012 along with liquid highlights from their favorite beer allies. All advance ticket buyers will be entered into a drawing for a complimentary pair of tickets to their 2012 Parade of Darks on Decenber 1st. More info at: www.wynkoop.com. Buy ticketsonline here. Worldwide - at a brewery, brewpub or tap near you. Cost: Per beer at your favorite watering hold. 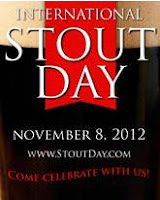 This November 8th is the second ever International Stout Day - a holiday for beer lovers to unite and make merry of the darkest, and some say, best style of beer out there. Stouts are darker and richer, so this year, when you're reaching for your pint, be sure it's a pint of the darkest brew you can find. Look for specials at a watering hole near you and give in to the dark side! Renegade Brewery - 9th Ave betw. Santa Fe & Kalamath St. Cost: $35 for YNPN members, $45 non-members. Come and support an organization that is attracting talented people to the sector, helping young non-profit professionals connect with their peers, providing programs that help develop current and emerging nonprofit leaders, and advocating for the interests of young nonprofit professionals. Attendees will enjoy unlimited tastings of Renegade's "offensively delicious" beer, enjoy heavy appetizers and have the chance to win fabulous prize packages. Live music on hand as well. For tickets and details visit: www.ynpndenver.org/kegs. Oriental Theater - 4335 West 44th Ave. Cost: $39 advance, $49 at the door. Move over wine, the Craft Beer movement is in full force. The Chef and Brew Festival, happening November 15th at The Oriental Theater, is taking this movement to the next level. Twelve of Denver’s top Chefs and twelve of the city’s best Brewers will be challenged to celebrate and create the ultimate beer and food pairings. Guest will then have the opportunity to vote for the Overall Winner. About 500 festival attendees are expected, making this a more intimate festival experience. Beer and Food will be served in a tasting format, 2oz beer pours paired with an appetizer from each chef. Guests will receive a souvenir festival tasting glass with full access to the beer and food once inside. Cost: Free to attend, The White Buffalo concert at 9:30pm is $15 adv/$20 door. Their celebrating 10 years of CANning Dale's Pale Ale and it's time to party. The celebration features two killer opening bands (free shows) - Erik the Viking & Interstate Stash Express, followed by a rockin' concert by The White Buffalo (ticket needed). Beer and food specials all night, a silent disco, and giveaways, including a cabin suite for two to Mountain Song at Sea, the first ever bluegrass cruise. www.oskarblues.com. Cost: $25 members, $30 Non-members advance, or $27/$32 at the door. Head up to Monument Hill for the 1st Annual Brewfest on the Hill at the Monument Hill Country Club. Enjoy a German sausage buffet, live music, contests, prizes and of course plenty of beer from local breweries including: Pikes Peak Brewing, Bristol Brewing, Oskar Blues, Trinity Brewing and Ska Brewing. Cost: Per beer- available in flights & single pours. 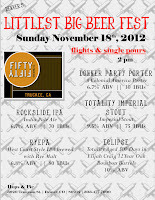 This month's Littlest Big Beer Fest will feature the beers of Fifty Fifty Brewing Company of Truckee, California. 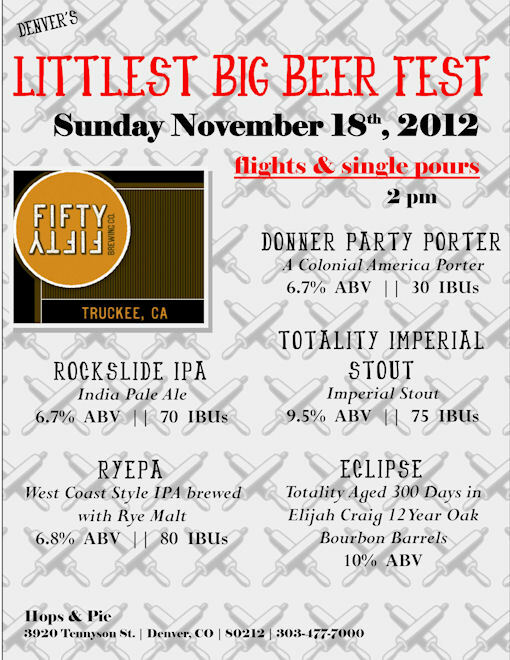 Fifty Fifty is bringing along 5 different hard to get beers including: Donner Party Porter (Colonial American version), Totality Imperial Stout (9.5% ABV), Rockslide IPA (70 IBUs), RYEPA (West Coast Style IPA) and Eclipse, a strong ale aged in oak bourbon barrels. These brews tend to be higher in ABV than most so bring along a designated driver. Pikes Peak Brewing Co - 1756 Lake Woodmoor Dr. Cost: $17.50 minimum donation, or $45 for 1# of pork and a growler to go. Pikes Peak Brewing is throwing a pig roast as a fundraiser for Tri-Lakes Cares, their local food pantry. Your donation includes a big plate of pork, green beans, cole slaw, dessert and a beer (or root beer or lemonade). You can even get some to go if you can't stay. Tickets on sale at PPBC and are limited. Visit www.pikespeakbrewing.com for more details. They are also accepting food donations at the brewery for the TLC pantry. Dry Dock Brewing Co - 15120 E. Hampden Ave.
Mark your calendars. This year's Ho Ho Ho Slapdown has been set for Saturday, November 24th from 12pm to 5pm. Every year on the Saturday after Thanksgiving the Dry Dock Brewers go head to head with a special brew from each of them. The best part is you get to choose the winner! Make sure to come in and cast your vote for this years Ho Ho Ho Slapdown champion! There's gonna be some great beers being brewed again this year. Join in for a guided 3-year vertical tasting of Mephistopheles' manifestations and pairings of exquisite culinary confections. Tickets went on sale November 5th in the Tap Room. Call (303) 440-4324 or stop in the tap room. Tickets are extremely limited and will go quick. - December 2012 Colorado Beer Festivals Calendar. - October 2012 Colorado Beer Festivals Calendar. - Colorado Beer Dinners and Pairings Calendar.